Whether you are a police officer, a firefighter, a military operator or any other rugged professional, you know you need special clothing to get the best performance on your job. No matter how challenging your job might be, it’s a sure thing that you can only be your very best if you feel comfortable and confident in your clothing. In these special situations your apparel has to be, head to toe, the high performance kind. Your apparel has to be durable, useful, flexible and to suit up the most capable gear. Tactical pants. The whole nine yards. We can’t talk about tactical apparel without talking about tactical pants. These pants are related to cargo pants, but include some changes as they are specially designed for various professions, going from EMTs, FBI to SWAT team agents, military and fire professionals and law enforcement officers. 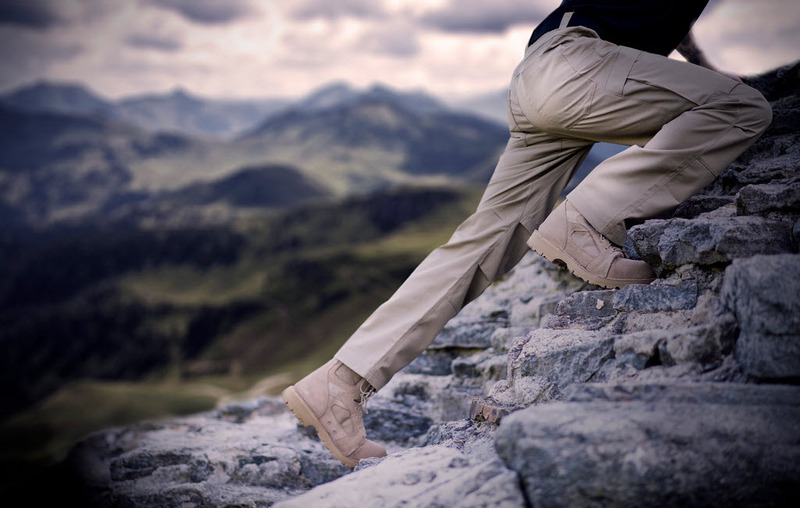 Tactical pants were worn by mountain climbers in the beginning but nowadays they come in various styles. Most tactical pants are solid in color and this is what makes them different from cargo pants. Tactical pants are made of lightweight materials (35% poly cotton ripstop and 65% polyester is the most frequent combination) and they feature strong, thick belt loops to support a big belt. You do need to hang to this belt cuffs, sidearm or other weighty gear. Typically, tactical pants have external knife pockets and the seat is double reinforced. The knees give good abrasion protection and, on the models that offer this feature, you can use neoprene knee pads inside the knee slots. Tactical pants come in many styles and you can reinforce them according to your needs. This goes from gussets, bar-tacks to even coating the tactical pants with Teflon. There are some tips to look for, some things to pay attention to when buying your tactical pants. For instance, good tactical pants should be DWR-durable water repellent. This means they are stain resistant and dry quickly just as well. Many good tactical pants have easy-access, top-opening mag pouches on both legs. The pockets have elastic webbing inside to help you store wisely whatever you might need: knives, flashlights or any other items needed for easy access. When you take a look at tactical pants, look for the ones that feature vertical zippered storage pockets outside for an easier access while seated. Keep in mind that it’s also a good idea to have large hidden zippered pockets to keep the most precious items secure, yet easily accessible. Double layering on the seat and knees is also something important for good tactical pants- it only gives you more protection and durability to the pants. Your new tactical pants should also feature many cord loops, especially on the front waistband so that you can attach carabiners or other gear items. Hand pockets and leg cuffs need to have reinforced hems so that your tactical pants last longer. These imported tactical pants are made from 65% Polyester and 35%Cotton and this makes them lightweight. They are comfortable and give freedom on the move, no matter how heavily loaded they get. Because you can add as many things as you need since they seem to have a pocket for everything. The pants have an elastic waistband and no less than 7 belt loops, extremely useful. The external knife pocket, the rear web strap allow you to pack all the gear you need for your work or on your trails. There are almost 50 individual bartacks in high stress areas and the pants are triple-stitch reinforced… so they are long lasting as hell! The YKK zippers and Prym snaps hold up pretty good, no matter where you go. The double thick seat and knees (knee pad ready) add on to the pants being long lasting. These tactical pants are made of Taclite poly/cotton ripstop fabric which gives them high performance no matter how hot or wet it gets outside. This fabric is Teflon treated so it protects against stains, spills and soil. The slash rear pockets and the D-ring from the hip help you with your keys or ID. These lightweight tactical pants have many details, are breathable and comfortable. They are easy to wash, the colors don’t run out and they dry quickly also. 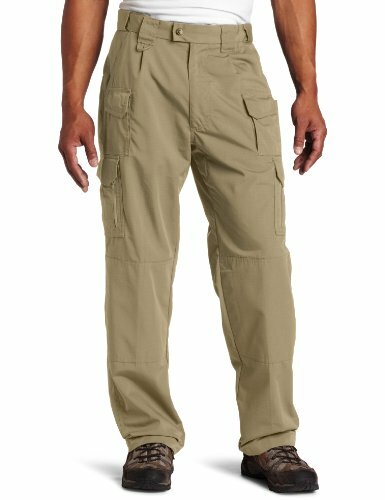 The full gusseted crotch and the single pleats, the Velcro cell pockets make these tactical pants a great investment any time. All in all, they may be a great fit for you, since these are some of the best tactical pants out there. Check out the price and reviews on Amazon. 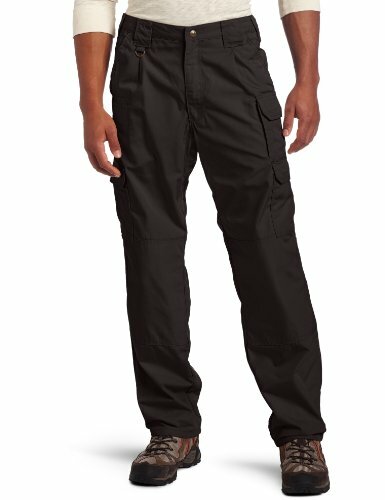 These imported tactical pants are made of 65% polyester and 35% cotton and are created to take any tough trail or environment. The top-opening cargo pockets are large and have 2″ elastic webbing inside for better securing your items. This gives you easy access to these items. The belt loops are also very wide, reinforced so that you could use strong belts. The silicone grip strip in the waistband keeps your shirt tucked in so you don’t have to worry about this. You can cold machine wash these pants, but it’s better to use a special solution so that you maintain the DWR feature as long as you can. You should also not bleach these. Tumble them dry at low heat, iron at low heat, and do not dry clean them. The fabric of the pants is Teflon DWR (Durable Water Repellent), which makes them protected to stains. They also dry quickly. The double layering in the seat and knees make these pants durable and heavy duty. The YKK zippers and Prym snaps add on to that. You can make all kinds of moves when wearing these since the crotch is gusseted- freedom on the move, for a long time to come! There are expandable, hidden waistband slides to enlarge the waist size (so, yes, have another donut 🙂 ). The hand pockets are angle-cut and come with flat edges so that you can better place your knives, pens, or sharp items. These pants feature easy-access, a top-opening mag pouch on each leg and large, top-opening cargo pockets. The rear hip pocket is also zippered . We’re not done with the pockets though. The front thigh pockets come with zipper pouches and hook & loop top to keep your valuables safe. You can also attach carabiners or other gear to the front waistband thanks to the 550 cord loop. The cuffs and hand pockets have reinforced hems. the pants may arrive to you with some creases. You can solve this by washing them before the first wear. they’re not the cheapest on the market. But, when we draw a line, we still think these tactical pants are a good buy at all times. 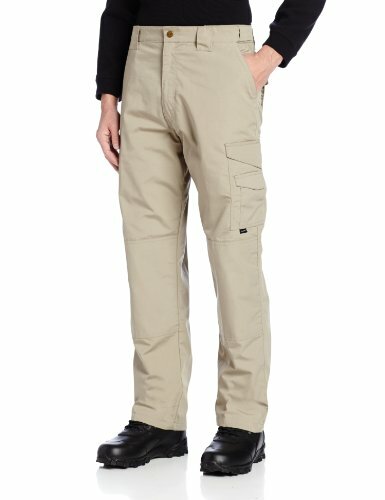 When you are on a hunt for a good pair of tactical pants but don’t want to spend too much money, these are a great option. They are imported, made of poly/cotton and offer good protection and options to organize. They fit well, true to size and are pretty thick. They are made of Dupont Teflon fabric and keep away stains and liquids. This fabric is also resistant to fading, shrinking and wrinkles. The D-ring helps you hang your keys or other tools. These pants offer you 9 pockets to organize, all with Velcro. They feel as comfortable as denim and may also work in the winter as they are thick enough. The waistband is elastic which gives you great comfort and a perfect fit. These pants feature an innovative wallet, “pocket in pocket” so that you don’t have to sit on your wallet. But, for the money you pay, you still get a very good pair of tactical pants. In case you’re not a big fan of Polyester, but still want to get a good pair of tactical pants, these really deserve a try. They are imported and made of tough Cotton canvas. They give you no less than 7 pockets to store your gear, a signature rear strap and slash pocket design. There are double and even triple-stitches and almost 50 bartacks in high stress areas. The pants have self-adjusting waistband and give a good fit for better comfort on the move. The YKK zippers and Prym snaps and the Velcro seals on the back pockets keep your items secure. You can hang your keys to the D-ring. These pants are durable since the seat and knees are double thick and knee pad ready. Many have found the cell phone pocket extremely useful as well as the zippers from the lower pockets. These heavy duty tactical pants are as comfortable as a pair of jeans and their triple-stitch reinforcements make them long lasting. 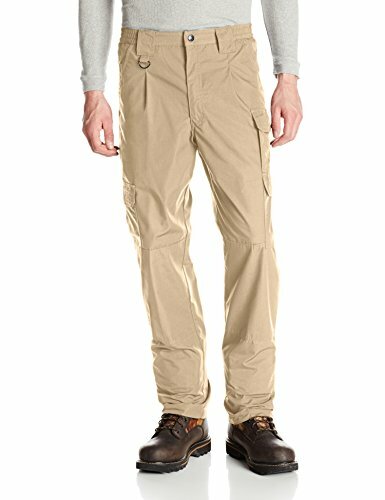 These 65/35 Teflon coated polyester cotton rip-stop tactical pants come at a great price and meet all your needs for the outdoor, heavy duty activities. They give you 14 pockets to custom organize your gear and an elastic waist band that gives them a perfect fit. They have a strong build, are wind resistant, durable and can take any challenging tactical mission. They’re also comfortable and lightweight. They are easy to clean, easy to iron, wrinkle resistant and quick drying. The back pockets are expandable and feature hook and loop closures. There are also 2 knife/accessory pockets with stiff fusing inner lining and 2 cell phone/magazine pockets. The pockets are symmetrical and give the pants a clean, neat look. The YKK brass zipper and Prym snap make these pants long lasting. The same goes for the reinforced knee with inside opening for knee pads. Other than this, these pants are a perfectly valid option any time. As always, make sure to check out the price and reviews on Amazon. 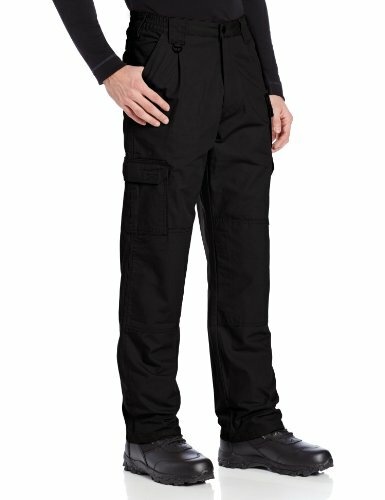 As a great option for you on your daily business, you can go with these Stryke Pant w/ Flex-Tac by 5.11. Even though they have the qualities of any tactical pants, they are not as heavy weight as others. These pants are made of 65%Polyester and 35% Cotton and give plenty of pockets to secure your items. The cargo pockets have pockets within and the hand pockets are reinforced- so you can load them all you can. The bottom of the pant’s legs has openings for a blousing strap to be inserted when needed. The pockets are placed just in the right places and the pants don’t bind when sitting, giving comfort at all times. They are low-profile angled and provide easy access. The double knee is subtle and comes with an interior knee pad pocket. The badge holder front belt loops give you the chance to hang your items/gear and the self-adjusting tunnel waistband ensures a good fit. These pants are a great buy as they work for your daily tasks and the weekend trips as well. Make sure to check out the reviews and price on Amazon. The 5.11 Covert Cargo Pants are made of 100% cotton. They have double and triple-stitch construction and bartacks in the high stress areas. There’s is also Cordura nylon lining in select zones. The pockets are deep and the pants have dual front and casual looking rear pockets. There are large covert pockets on both legs where you can wear your magazines. The pockets have also a sleek, subtle design. You can even wear two pistol mags thanks to the two zippered pockets. The YKK zippers and Pryms snaps make these pants last for a long time. The self-adjusting tunnel waistband gives you a good fit. 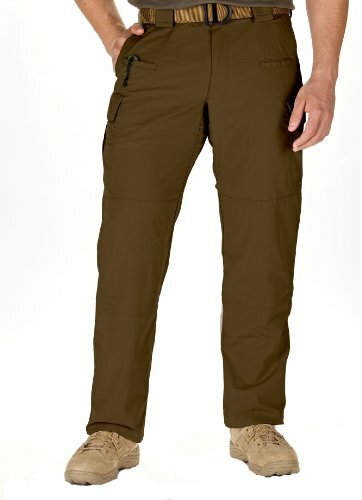 These tactical cargo pants have a good built, a clever design and give massive cargo space. They work great when traveling and the tough, breathable material makes them long lasting. But, all in all, these pants will serve you good as tactical cargo pants. These pants meet high expectations when it comes not only to their make, but also their weight. They are made of cotton and polyester and are rip-stop. The fabric is strong and extremely light and resistant. The elastic waist band gives you the chance to achieve a perfect fit. The pants come with nine pockets and work for your outdoor activities but also for your challenging job-if that’s the case. The fabric used for these pants is fade, shrink and wrinkle resistant. The DuPont Teflon fabric used keeps stains and liquids away. The pants are breathable and run true to size. When it comes to storing your items, these pants give you many options. For instance, the rear pockets have a second pocket on the inside- a place to put your wallet away. The pants come with a nylon belt that is strong and thick. There is also a D-ring for keys and other tools. All in all, these are great lightweight tactical pants, and could easily find a happy owner. Check out the reviews and price on Amazon. Just because it’s summer and it’s pretty hot it doesn’t mean you have to give up on your challenging trips. You can put on these nylon Columbia Silver Ridge Convertible Pants and be on your way. 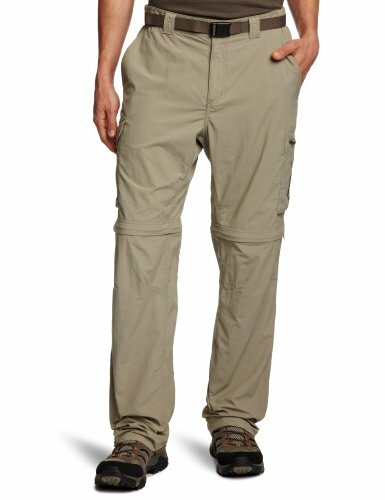 These pants are very light and come with side cargo pockets and several other pockets for the back, front, patch, side and flap. The pants are straight-leg convertible so they may become shorts if you’re too hot. 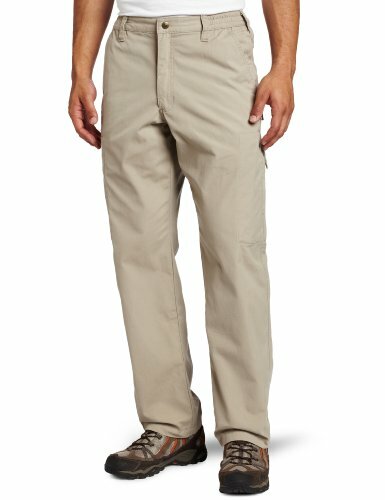 There is Omni-Wick advanced evaporation technology used for these pants which makes them breathable and wind resistant. They dry very fast also. These pants give you sun protection thanks to their Omni-Shade UPF 50 feature. The zippers are high quality, as are the fabric and the stitching. The nice and useful belt is a good fit, just as the elastic waist band does. The pockets give you maximum storage space. The pants are easy to assemble back as they are labeled “L” and “R”. But, these pants are amazing for your summer outdoor activities, no matter how challenging they might get! It’s also worth taking a look at the reviews and price on Amazon.